I have to say that this was the surprise CD of the year for me. Nik Turner’s Space Ritual have released quite a few not very good live recordings in the past couple several years and so my expectations that he and the old Hawkwind crew (Dave Anderson, Del Dettmar, Thomas Crimble, Mick Slattery, Terry Ollis) would make a great record were quite low. But…. This is a great new space rock CD. Cleary Dave Anderson had a large part to do on this. It does not sound like the old Nik Turner repeat of history over and over but a nice fresh sound, even though a few old Hawkwind/Michael Moorcock tracks are recycled but performed in different and interesting ways. 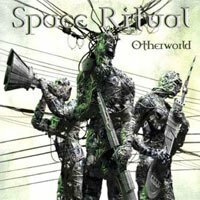 After a spacey intro the CD begins with the title track, Otherworld. This features really nice strings, flute and acoustic guitars and has a great vibe to it. A very nice sound production as well. The Black Corridor has gone from a electronic track to a spacey track with a beautiful guitar solo. Bubbles is a stoned groove space rock track with soaring guitar, floating space and a nicely spaced out Nik and leaving plenty of space for all the members to do nice solos in the middle as well. Communique II has that tribal feel and leads directly into Ritual of the Ravaged Earth. A lot of really good lyrics by Nik as well on this CD. I am not so sure I like the electronic drums-percussion on this track. ASDF is a short spacey piece with some cool piano that leads into the great track Sonic Savages. I really like the vibe on this one and the use of the acoustic guitar. Really nice melodies and plenty of spaced out sounds as well.. Droid Love is next laid back track featuring Nik playing some beautiful sax. Time Crime features Jerry Richards on guitar and some potent lyrics. Very melodic and the combination of Nik and backing vocal of Jacki works nicely. Arrival in Utopia is a really interesting reworking around Del’s piano playing. Quite simple but effective. Atomik begins with some acoustic guitar that will sound quite familiar. This is a beautiful track as well and written and performed by Thomas Crimble (12 string guitar). The Riddle and Walking Backwards are the most uptempo rock tracks on the CD and both really good again allow the band to do guitar and sax solos. Great stuff.. Anyway.. this is really a surprise and I hope that this band will continue to write more original material and stay away from playing all the Hawkwind era stuff that almost none of these guys played on… Keep spacing Nik….. I'm so glad this isn't called Nik Turner's Hawkwind, because to the credit of all involved, that is not what this is about. In addition to Nik we've got an assortment of Hawkwind alumni, including Terry Ollis (drums), Del Dettmar (axe synth), Mick Slattery (guitars), Thomas Crimble (guitars/keys), Dave Anderson (guitars/bass), and several others guests. And it's clear that Anderson was heavily involved in the resulting sound of this album, as his name is in nearly all the writing credits, he produced the album, and it was recorded at his Foel Studios. A brief preparing-for-liftoff introduction leads into the albums title track, which blends pure space rock lyrics with a strange kind of hip-hop like style during the verses. A good solid song embellished by Nik's sax, brief but very cool guitar solos and the expected colorful electronics. "Black Corridor", a spoken word piece from Hawkwind's "Space Ritual" album, is given rich new life with excellent cosmic backing music to Nik's efx'd voice. This leads into one of my favorite tracks of the set - "Bubbles", an excellent space-prog rock song with a powerful spacey symphonic sound and lots of jamming. Nik has a great voice for this music and "Notes From A Cold Planet" and "Arrival In Utopia" (another Hawkwind resurrection) are other fine examples of Space Ritual's flair for backing spoken word pieces with good music. "Ritual of the Ravaged Earth" has an 80s electro-pop style that I liked and is combined with Nik's spoken vocal style. "Sonic Savages" and "The Riddle" are among the album's best power rock songs. The former has a sort of Led Zeppelin "Kashmir" feel to it. But that's mostly due to the rhythmic drive. Nik really takes off on sax too. A good rocker with a heavy orchestral sound. And "The Riddle" is just damn good ripping rock 'n roll. Ditto for "Walking Backwards", though it's much more purely space rock than "The Riddle". "Time Crime" and "Walking Backwards" are the album's true groove tunes. "Time Crime" gave me the feel of being on some Caribbean island that just happens to be inhabited by aliens. And "Walking Backwards" would have been right at home on an ICU album, though Space Ritual give it more of a potent space rock edge. There's lots of variety on the album and several songs serve as transitions and to just generally keep things going in different directions. Like the gorgeous deep space instrumental "Droid Love", which includes great leads by Nik's sax. And "Atomik" is a Crimble/Slattery penned instrumental with a pleasant acoustic guitar melody and a dreamy floating vibe. Whether singing or doing spoken word, Nik is a more than effective vocalist and really gives the album much of its character. Overall, this is an impressive album. And held up next to the most recent Hawkwind album, I'd say the Turner camp is the one to watch if you're a Hawk fan that wants something fresh and exciting.